"The Eyes watch us all, gathering our secrets in hopes of ending the Light." 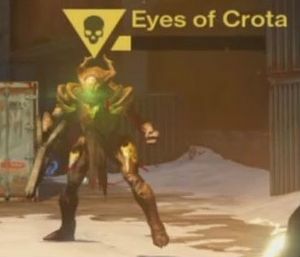 The Eyes of Crota are three Hive Acolytes that are a target in the Disciples of Crota Quest. The Grimoire image for the Eyes is that of an Ogre, but the quest features Acolytes. This may be a developer oversight. So far, the Eyes of Crota are the only bosses that take the shape of Acolytes.